Recent AP Story about how Yonkers will become a new breeding ground for mice soon, and the mayor is amazingly, really happy about it. A consortium of NYC medical hospitals and facilities are going to offsite their lab mouse breeding facilities, and move it to Yonkers. They expect to have in the area of 400,000 mice living and growing in cages. This "mouse house" is the first multi-institutional facility in the country. 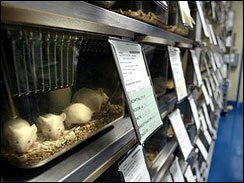 Most major institutions have their own mouse labs, sometimes part of a larger animal research lab. At Rockefeller University, 120,000 mice are kept in a building on Manhattan's wealthy Upper East Side. Dr. Fred Quimby, director of the Rockefeller lab, said 20 percent of his operation would be shifted to Yonkers, allowing the school to expand the lab without paying for more New York City real estate. So what I'm wondering is, if you put a population of 400,000 mice together in a single building, what do they sound like? What do they smell like? Do Alleycats from miles around come a-courtin'? And what are they doing with all the mouse poop? Comments on "The Mouse Comes to Yonkers (and I don't mean Mickey)"